If I’m honest, I had never heard of the country of Malta until my husband mentioned that we should visit the tiny island. We were living in Europe at the time, so it was simply a quick flight and we’d be on the ancient piece of land. Malta is likely named after the Greek word Melite, which means honey, because there is a surprising rare species of bees in Malta. Situated in the Mediterranean between Sicily and Africa, the country of Malta consists of three small islands. It covers a small but packed 121 square miles and is inhabited by less than half a million residents. However more than 1.6 million tourists visit this beautiful country. We stopped in Valleta, St. Paul’s Bay, Mdina, Mosta, and Marsaxlokk. There were fantastic coastlines, impressive buildings, quaint squares, lovely cathedrals, military areas, and plenty of marinas. But one tourist attraction stood out among the rest. The most impressive place we saw, and where we spent a fair amount of time, was on the southeast side of the island. The village is called ?urrieq, but the location of this beautiful site is Wied i?-?urrieq. 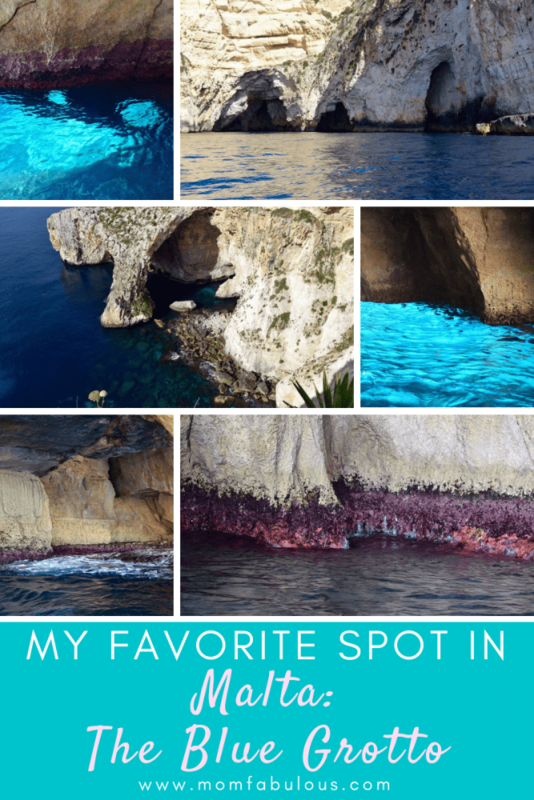 The attraction is the Blue Grotto. Seven caves run along the coast, filled with vibrant colors and impressive stones. We boarded a small boat with a handful of other tourists. Naturally we were stuffed into bright orange life jackets and seated beside one another in our bulky safety gear. The friendly tour guide also functioned as captain of our mini ship. 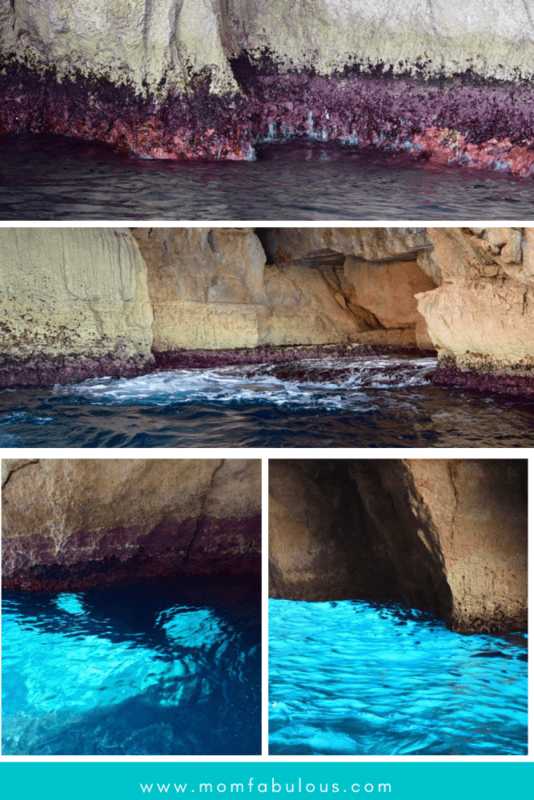 We were slowly whisked from the dock across the Mediterranean coast to the caves. The cliffs are impressively high but the water is also impressively blue. I remember that it was tough to decide where to look and what to take pictures of! The boat crept along the coast, in and out of caves, and up and down the waves. The caves varied in size. Some were small, too tiny to even navigate the canoe through. Others were spacious and deeper than we could venture without a flashlight. It’s best to take this trip on a sunny day. Mornings tend to have the best light. And watch for wind; if the water is too choppy, you can’t go out on the canoes. The bottom of the sea is covered in limestone, which is what creates the magnificent blue color of the water when the sun shines on it. The bottom of the sea is also more than 13 feet deep…but the water is crystal clear so it appears to be only 2 or 3 feet deep. Some of the caves had “windows” in them, which were circular holes that allowed the sunshine in. It illuminated the cave in glorious light! The colors are magnificent! Red coral dots the walls. Minerals also create purple, orange, and pink colors. Hagar Qim and Mnajdra Temples. These temples were built between 3200-3600 B.C. They remained undiscovered until they were dug up in the 19th century. Although they reveal some fascinating facts about the culture and inhabitants, many mysteries still remain. Like the buddha figures. Or how each year, on the summer solstice, the sun shines through a hole to create a circle of light on a precise spot. Similar holes were created for the winter solstice, fall and spring equinox, and for the positions of bright stars Plus, it’s just old…3600 B.C.! 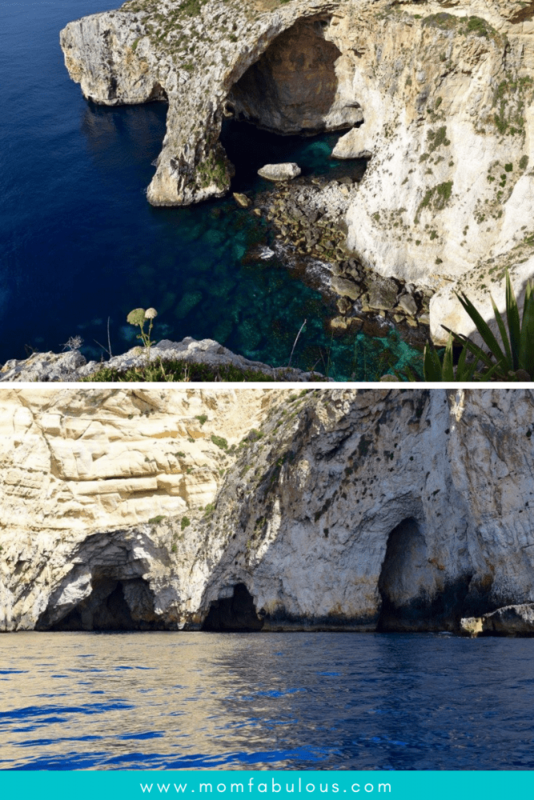 Malta’s Maritime Traditions in The Three Cities. Vittoriosa, Senglea and Cospicua are impressive fortress walls and marinas that offer fantastic views of the cities, boats and ocean. The Dingli Cliffs look quite similar to Ireland, but don’t be fooled. This is a great stop to let your kids roam and run, or to take a picnic for great views.